A marvelously grisly premise kicks off D'Amato's (Hard Bargain, etc.) new mystery featuring Chicago food writer Cat Marsala: Cat finds that the soup bone she purchased earlier from Spencer and Angelotti, a pricey food emporium, is actually part of a human leg. Was someone butchered and disposed of in Chicago's most upscale meat department? Of course. But who? And why? In order to find out, Cat, with the blessing of her good friend Chief of Detectives Harold McCoo (a gourmet in his own right), goes undercover at Spencer and Angelotti as a catering consultant. She casually interviews some elite customers of the trendy catering department and finds that its manager was revered as a creative chef dedicated to meticulous service. But he has been missing for several days. Is he the victim? Is his wife's reputed lover, the store's head baker, guilty? Or is the killer a disgruntled customer, or one or more of the seemingly benign yet hostile vegetarians who are constantly picketing the store? A vivid supporting cast, sprightly yet controlled wit and some fine cooking advice (watch for too many red herrings) combine to make for another delightful mystery from the ever-reliable author. 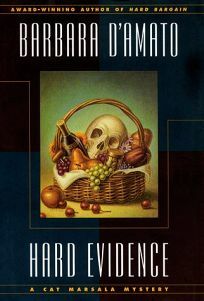 (May) FYI: D'Amato has just been elected president of the Mystery Writers of America.